CHICAGO - 2012 AAPS Conference - (Oct. 15, 2012) –Thermo Fisher Scientific Inc., the world leader in serving science, is featuring a combined FT-IR spectrometer/rheometer that provides a powerful analytical workstation for rapidly optimizing the pharmaceutical manufacturing process. The Thermo Scientific Rheonaut module enables the Thermo Scientific HAAKE MARS III rheometer to be coupled with either a Thermo Scientific Nicolet iS10 or Nicolet™ iS™50 FT-IR spectrometer to help researchers easily identify and quantify changes in product properties. This streamlines the development process and speeds time to market for new products. The combined FT-IR spectrometer and rheometer features a rapid multi-technique assessment that is deployed in less than 60 seconds for fast-changing samples. 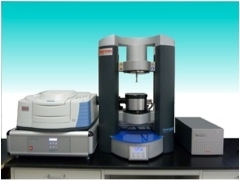 The seamless coupling of the instruments enables identical sample and simultaneous test conditions as well as reliable correlation of results. With this streamlined process, researchers have an enhanced understanding of material properties needed to help improve productivity and efficiency across the lab. Existing Thermo Scientific HAAKE™ MARS™ users can upgrade their installation with the Rheonaut module to enable the FT-IR coupling. Thermo Fisher will showcase the FT-IR spectrometer/rheometer combination within Thermo Scientific booth 4519 during the 2012 AAPS conference in Chicago, Oct. 14-18. Thermo Fisher, one of the pioneers in rheology, successfully supports a wide range of industries with its comprehensive Thermo Scientific material characterization solutions. Material characterization solutions analyze and measure viscosity, elasticity, processability and temperature-related mechanical changes of plastics, food, cosmetics, pharmaceuticals and coatings, chemical or petrochemical products, plus a wide variety of liquids or solids. For more information, please visit www.thermoscientific.com/mc.